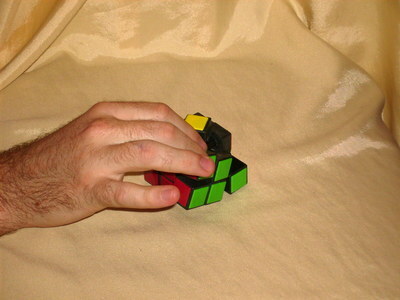 This page shows how to put your rubik’s cube back together again, after it’s been taken apart. 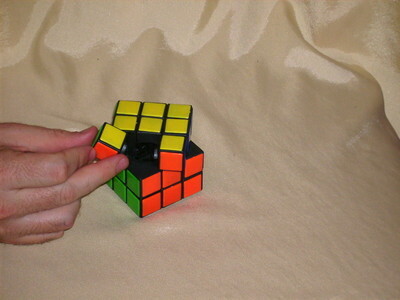 Follow the instructions here, and your cube will be good as new again very soon. I hope. Actually, it depends. 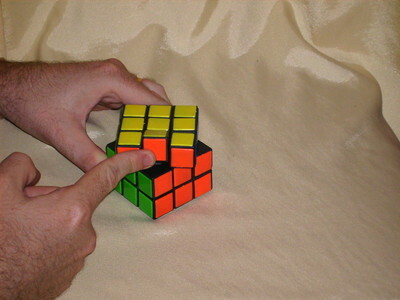 If you followed the instructions on this web site for dismantling a rubik’s cube, then you can probably follow the instructions below and put it back together. If your cube is in pieces because your eight-month-old threw it down from the top story of your house, like mine did, your chances of success are considerably slimmer. 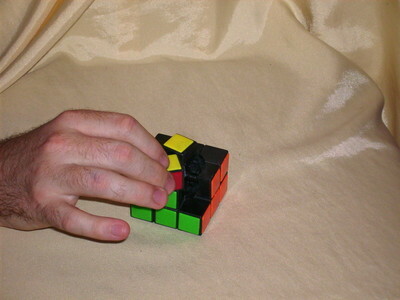 Always reassemble your cube in the solved position! You think you then have a 92% chance of watching smugly and giggling as your friend tries and tries to solve your impossible puzzle. 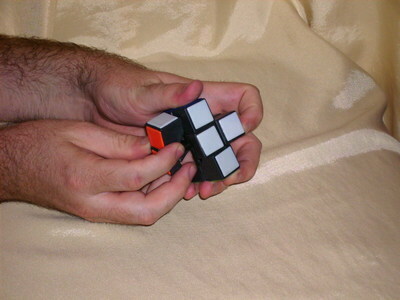 Two minutes later, the expert cuber will give it back and say ‘It can’t be done. You must have taken it apart, and put it back together randomly, either as a lame attempt at a practical joke, or because you didn’t follow the instructions on The Rubik Zone‘. This is no fun for you. You then have to take it apart again, and reassemble it in the solved position, just like I told you in the first place. The first four pieces are the hardest. There’s so little for them to hold on to that they tend to fall out all by themselves. Collect four edge pieces that share a sticker colour (for example, I did white for this photo). With one hand, hold the pieces you’ve already done in place. With the other, slide in the other edge pieces one by one. You may need to slide them into a position off the face they belong to, and then twist them into place. 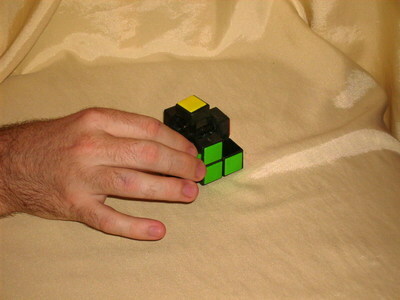 When all four are in position, carefully place the cube on a surface, with these four edge pieces at the bottom. Got that done? Was it very frustrating? Well, from now on, if you follow these instructions, there’s not much chance that the half-assembled cube will begin to fall apart again. You should be able to make steady progress. 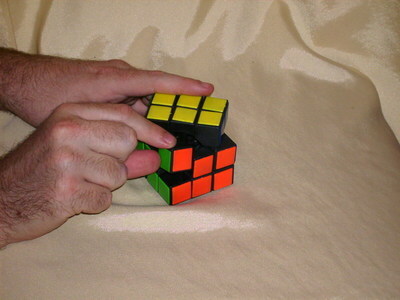 You are assembling the cube in the solved position, aren’t you? The four corner pieces on the bottom layer will just drop into place. You should then replace three of the edge pieces in the middle layer. Yes, I said three, not four. You need the empty gap later. It should be very easy to replace the first corner piece of the top layer. Using the gap in the middle layer, slide the correct edge piece next to the corner you’ve just done. You are probably wondering why I’ve got red pieces on the green face. Well, as long as the pieces in the top layer are all correctly positioned relative to each other, I can always give the cube a quick twist at the end to get it solved, right? Do the more top layer pieces like this – corner, edge, corner, edge, twisting the top layer each time so you can use the gap. Keep going until the top layer is all done, except for two corners and the edge between them. It’s time to slot in the last piece from the middle layer. Push it down, like you pushed down the other three. It’s very easy to insert the last two corner pieces. Just rest them in their proper places. Finally, with the top layer twisted 45 degrees, you can put the final edge piece in place. Push it in, and you’ll soon here a satisfying ‘click’ as it finds its proper home. 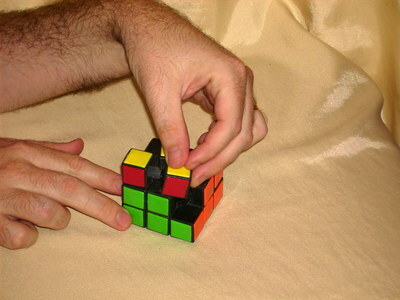 And that’s how you reassemble a rubik’s cube. 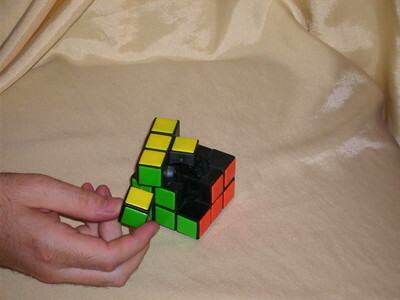 Err, you did reassemble it in the solved position, didn’t you?Anyway, here’s a video version of the same instructions. What am I supposedto do for a mirror cube??? The last piece thing didnt work…. Or maybe I just need to apply more force?